I've been addicted to Cupcake Wars and DC Cupcakes on TV. I love those shows. The bakers are so creative. So it got me thinking about my cupcakes and what I could do to make them different. We love Tex-Mex and I thought about making a Mexican inspired cupcake. I also bought some yellow mangoes at the flea market over the weekend in Savannah and decided to whip that into a buttercream. It was very successful! Mix everything together and scoop into muffin tins. I made 40 mini cupcakes. Bake at 350 degrees F for 15-18 minutes, or until the toothpick inserted comes out clean. The centers will fall a little, but it's okay, they are delicious! Beat the butter in a mixing bowl until creamy and smooth. Add 2 cups powdered sugar and beat until crumbly, add mango puree and beat until smooth. Add remaining powdered sugar and beat until fluffy. 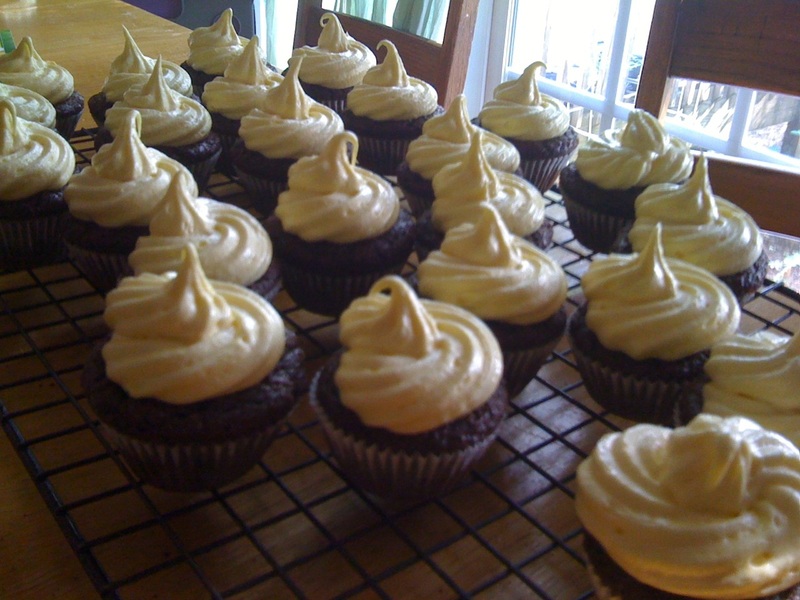 Place in a plastic storage baggie, clip the corner out and pipe onto the cupcakes. If you don't want to do that, frost them with a knife and enjoy! Saw your link on Hoosier Homemade. These look delicious! I'll have to give your recipe a try for sure. sounds good! I too am addicted to Cupcake Wars...My mind is always turning after it trying to come up with an "original" idea. how fun! Oh these look deliciuos, I just love inspired cupcakes, great job, I bet they are awesome with the pepper and mango. What a clever idea!They look wonderful! Thanks for joining in the fun on Cupcake Tuesday! Yummy!!! Your recipes always look so pretty! I just made these tonight and thought the cake was delicious! Just the right kick of chili. Had trouble with the frosting, though. Mine was still pretty runny after adding the three cups of powdered sugar and I found the sugar taste overpowered the mango. I'll definitely be making the cake again but will probably keep experimenting with the mango frosting.